You are here: Home / Skincare / Beauty and Fashion at President Obama’s Inauguration! Beauty and Fashion at President Obama’s Inauguration! 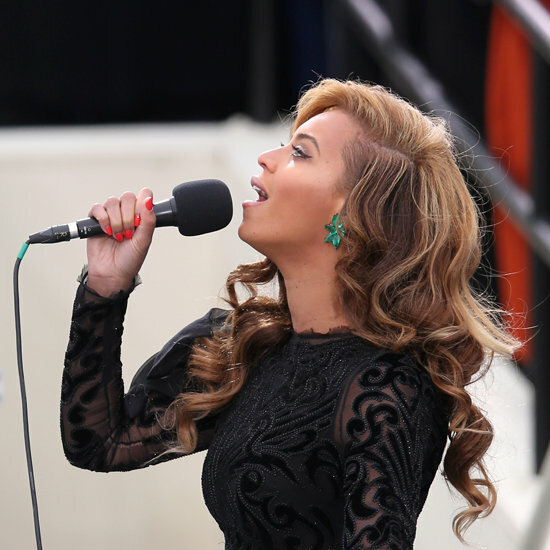 Not only was I blown away by Beyonce singing, “The Star Spangled Banner,” (even if it was prerecorded and lip synched!) I was also blown away by her manicure! The orange hued was so vivid it was nearly red! I loved looked Michelle Obama‘s Inaugural Ball look! She wore a red Jason Wu custom design paired with Jimmy Choo pumps and Kimberly Macdonald for Forevermark diamond jewels. And while we may not all have regular opportunities to wear designer dresses and sashay to a live performance by Jennifer Hudson, there’s bound to be a big night when you may just want to channel your inner Obama! Michelle even knows how to rock a coat and gloves! She wore a Thom Brown navy-silk, checkered-pattered coat and dress, a belt and shoes from J. Crew, necklace by Cathy Waterman and a cardigan by Reed Krakoff. She later wore Reed Krakoff boots, and added J. Crew gloves to her look. Her J.Crew belt is actually a sash from the bridal department: Collection rhinestone-encrusted sash. Call J.Crew at 800-261-7422 to locate the belt at a store near you. « Does the Bird Poop Facial Really Work?